The CW has released a new single from "Join or Die" episode 13 of season 3 of "The 100". Pike and Kane are held captive in Polis. Having convinced the main body of Ontari, Jaha and his gang continue to garner strong support from the side of the ALIE and the city of light. The plot is now conducted at Polis with Kane and Pike, held prisoner and asked to join the followers of ALIE swallowing the famous blue pills. Pike and Kane discover that Grounders have already joined the Jaha. Pike refuses to swallow the pill and finds himself taken to an unknown place, but that does not bode well for him. For his part, Kane is being squeezed and will play for time to find a solution. Interviewed by the magazine Enstarz , actor Christopher Larkin - alias Monty - has already given his impression on the season finale of season 3, which looks very dark "The first time I read the script of episode 16, I was shocked. I knew some things that were coming before reading so I was somewhat prepared, but all I knew was devastating. And not just for my character, it's horrible for everyone. " 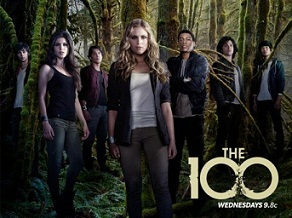 The episode 13 of season 3 “Join or Die” of The 100 will premier on April 28.